Industrial areas in the North East and Midlands are least resilient to economic shocks, BBC-commissioned research suggests. Middlesbrough is ranked as the most vulnerable, followed by Mansfield in Nottinghamshire and Stoke-on-Trent. The Experian research suggests how England's regions may cope with further public sector cuts. The study looks at the ability of each local authority area to withstand sudden changes in the economy. A clear north-south divide is evident in the research. Elmbridge in Surrey is the most resilient area in England, followed by St Albans in Hertfordshire and then Waverley in Surrey, the information suggests. The research, commissioned by BBC English Regions, looks at four key themes; business, community, people and place. Today's research reveals a clear north-south divide. It is a divide which is a legacy of government policy over decades. The Tees Valley in general and Middlesbrough in particular are places which became rich on heavy industry. William Gladstone famously went to the original town hall in Middlesbrough and proclaimed it an "infant Hercules". Go to the same spot now, as I did, and you find a sad, boarded-up building surrounded by wasteland and a few abandoned, crumbling houses. The area found it increasingly hard to compete in global markets and, over time, government felt obliged to pump in state support to prop up and regenerate the declining economy. The result is that a town like Middlesbrough has become state-dependent. How resilient is your area? Within these categories, a number of factors have been analysed, including the amount of vulnerable and resilient industry within an area, the life expectancy of residents, earnings of workers, unemployment and crime rates. Deputy Prime Minister Nick Clegg said the Experian research showed a north-south divide was already present in England. He said large spending cuts to be announced next month should be seen as part of a broader effort to put the economy on to a more sustainable footing. In his speech on the government spending review, Mr Clegg stressed the need to "balance the books". "A thriving economy cannot be built in the long-term on shifting sands of debt," he said. But Middlesbrough's Labour MP Sir Stuart Bell said Mr Clegg had "misconstrued" the economy. "The reason there's a north-south divide is because we lost our major industries in the 80s, like steel and shipbuilding, and jobs from those sectors went into the public sector. "We recalibrated the economy along those lines to the benefit of the North East." Sir Stuart said the government was making a "fundamental" mistake in thinking that the private sector would step in to create jobs. He added: "You don't go from the public sector to the private sector, you go from the public sector to the dole queue." The BBC commissioned the research as part of The Spending Review: Making it Clear season, which looks at the government's plans to make deep public sector savings. The results of the coalition government's spending review will be announced in October, when it will be revealed which departments will see their budgets cut and by how much. The Experian research suggests Middlesbrough will be the least resilient to such public sector cuts. It is ranked at number 324 out of 324 council areas. The Teesside town also appears as the least resilient in the business section. Alastair Thomson, dean of Teesside University's business school, said Middlesbrough had a high number of workers employed in the public sector, particularly in the NHS and education. Media captionNick Clegg: "We know decisions taken for the long-term are in the short term difficult, painful, unpopular"
He said there was very little of the traditional heavy industry associated with Teesside and the North East left, but new industries were emerging. "We are seeing a lot of growth in the digital sector," he said. "It is an area we see as having a lot of potential for the future." Middlesbrough Mayor Ray Mallon said the town's budget would be cut by more than £30m over the next three years. But he said the council had planned for it and was confident it could cope. "We will survive this because we have got the get up and go and the will to deal with what we have got in spite of a recession, in spite of an economic downturn, and that's very important," he said. The North East as a whole does not fare well in the Experian study. Redcar and Cleveland, Hartlepool, South Tyneside and Sunderland are all in the bottom 20 of the overall resilience table. 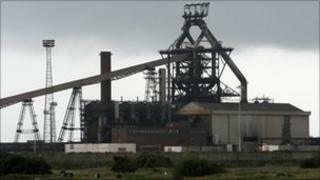 One of the area's large industrial employers, Corus steel works in Redcar, announced the partial mothballing of the plant and loss of 1,600 jobs in February. John Crook lost his job at the plant in March after working there for 25 years. He and his wife Jan decided to start their own catering business and obtained funding from their local council and from the government's Business Link scheme. Mr Crook said if such funding was cut by the government in the future, many people in Teesside would be unable to start their own business. "I can only hope that the new government is sympathetic to the area, that there's no north-south divide," he said. "We have relied very heavily on steel and heavy industry and most of that has gone now." At the top of Experian's resilience table is Elmbridge in Surrey, followed by St Albans in Hertfordshire, which also topped the business resilience section. Mel Hilbrown, director of St Albans and District Chamber of Commerce, said the main industry in the city was knowledge-based, such as finance and consultancy, which had proved resilient in the recession. "It's always been quite entrepreneurial as an area," said Mr Hilbrown, who is also executive director of the St Albans Enterprise Agency. "In the last five to 10 years, it's had a high number of business start-ups." The Spending Review: Politicians come face to face with the public across England to talk about the cuts. BBC One at 2235 BST on Thursday, and on local BBC radio at 0900 BST on Friday.